Tickets range from $30.00-$45.00 depending on your seat placement. The Lyric Theatre continues their Live at the Lyric series featuring The Milk Carton Kids with opening guest Anthony da Costa in concert on Friday, October 12, 2018. 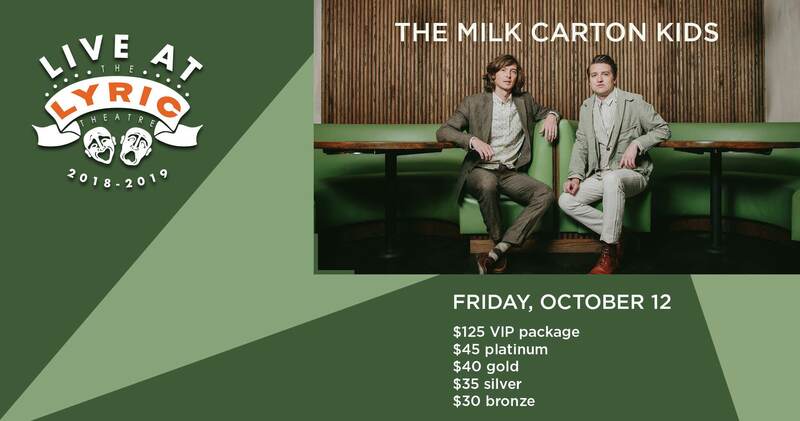 Many be familiar with the Americana Indie Folk duo The Milk Carton Kids comprised of Kenneth Pattengale and Joey Ryan, but have you ever seen them with a full band? This Fall will mark the first time this duo will tour with a full 5-piece band backing them. If you thought they were great as a duo, prepare to be blown away come October! The Milk Carton Kids are an American indie folk duo from Eagle Rock, California, consisting of singers and guitarists Kenneth Pattengale and Joey Ryan. The group begin making music together in early 2011. Known on the road for their adversarial, Smothers Brothers-evoking comedic banter as well as their virtuosic guitar skills. The band has recorded and released five albums and been nominated for two Grammys. The duo also won Best Duo/Group of the Year from the American Music Association in 2014. With his latest work, including his recent solo album "DA Costa", he adds the musical force of some of American folk and roots’ seminal cities to his forthright style. To view the event flyer, visit: https://i.imgur.com/4JIqAXD.jpg. For more information, visit: http://www.thelyric.com/ or https://www.facebook.com/lyric.blacksburg or call 540-951-4771.